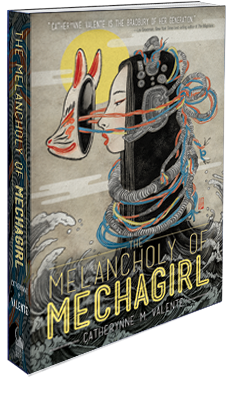 ﻿ THE MELANCHOLY OF MECHAGIRL « Haikasoru: Space Opera. Dark Fantasy. Hard Science. A woman who dreams of machines. A paper lantern that falls in love. The most compelling video game you’ve never played and that nobody can ever play twice. This collection of Catherynne M. Valente’s stories and poems with Japanese themes includes the lauded novella “Silently and Very Fast,” the award-nominated “Thirteen Ways of Looking at Space/Time,” and “Ghosts of Gunkanjima”—which originally appeared in a book smaller than your palm, published in a limited edition of twenty-four. Catherynne M. Valente is the New York Times best-selling author of over a dozen works of fiction and poetry, including Palimpsest, the Orphan’s Tales series, Deathless, and the crowdfunded phenomenon and national best seller The Girl Who Circumnavigated Fairyland in a Ship of Her Own Making. She is the winner of the Andre Norton, Tiptree, Mythopoeic, Rhysling, Lambda, Locus, and Hugo awards. She has been a finalist for the Nebula and World Fantasy Awards. She lives on an island off the coast of Maine with her partner, two dogs, and an enormous cat. It’s not easy to find her. You’ll have to endure a great number of miserable, dusty basements and private, antiseptic vaults where no rot can reach. You’ll have to handle- and I mean handle, for these collectors and archivists are of the most reticent, stuttering, anxious breed-men and women whose bloodless hands have permanently taken on the dry color of film preservatives. Your eyesight will be a friend and a traitor. It’s good if you don’t need too much sleep; she rewards vigilance. Sort through enough film-the old kind, the kind that comes on reels testosterone cypionate for sale, that, like an exotic, perforated desert plant, hates air and moisture and the wrong sort of light-and you might see her hair disappearing behind a camphor tree in The Tale of Chibisuke the Midget, a bare foot glimmering like a lantern behind a screen in The Spell of the Sand Painting Part Two. Perhaps her face, whole and round and silver and black, in the palace scenes of The Water Magician. Thousands, if not millions, of people have seen her and not known her for what she is-only another exquisite, ancient face in the exquisite, ancient silent films, flickering, monochrome, the color of a lost world. There is a Kami hiding in those old movies. Which is to say, a god.